Every business needs a dashboard, if not how do you run your business? Are you manually asking your Controller to run reports? Your purchasing manager or your sales director for the daily sales number? Want that information on the go? 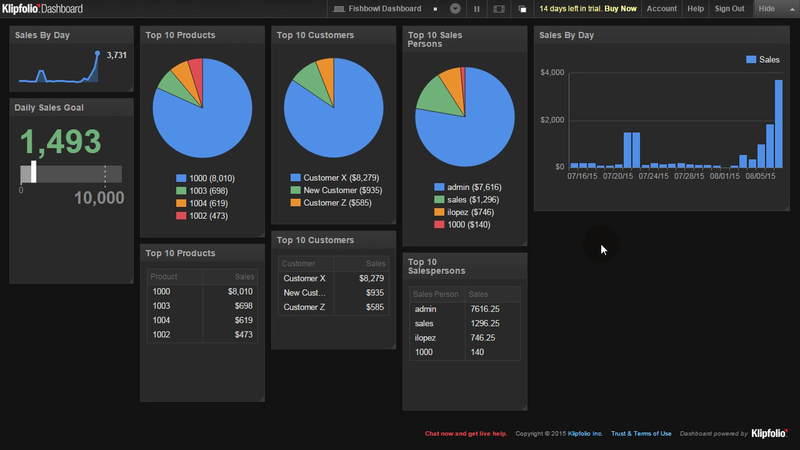 A lot of my customers want a dashboard, but they werent sure how to get it. I have a solution. Klipfolio. Klipfolio is a Business Dashboard platform in the cloud. Klipfolio operates like a webpage with visualizations created from data. This data can come from Google Analytics, Twitter, and over 50+ Online data sources, plus databases such as Fishbowl Inventory. Klipfolio is cheap, less than Starbucks cheap *. As of this writing standard users are $20/user/month. You do need help to setup the infrastructure for Klipfolio to connect, but that takes less than one hour. There is a “startup” cost with building dashboards, but they helpfully have a library of online videos on how to do many of the popular visualizations. Custom solutions may require the help of consultants. Below is a quick informal demo on a Windows Computer. Give us a shout on our contact page or via our telephone number. We would be happy to setup an implementation plan and scope to get this going.